This is a tasty treat. This one was literally tried and tested over 10 times until we got this right. This features a soft texture and a complex chocolate flavor. 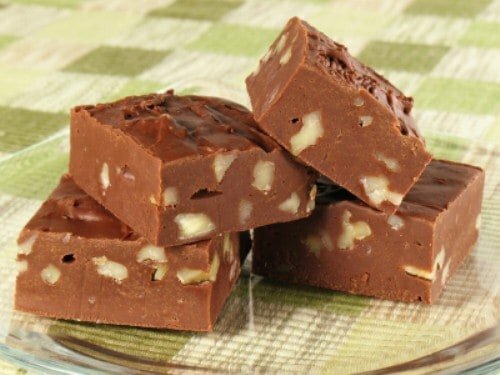 Mrs. Fields Decadent Chocolate Walnut Fudge is so easy to make. Place sugar, milk, corn syrup, salt, and butter into a 2-quart saucepan that has been sprayed with a none stick spray. Place on medium heat and stir until mixture starts to boil, do not scrape the sides of the pan. When mixture starts to boil gently reduce heat to low and place a lid on the pot for 60 seconds. When time is up remove the lid and let boil lightly until the mixture reaches a soft boil stage. Turn heat off add chips, vanilla, and marshmallows. Stir gently until all is melted. Pour while mixture is still hot into a glass or stainless mixing bowl that has been sprayed with non-stick spray let set for 5 - 7 minutes until it cools slightly but still warm. Then beat for about 5 - 6 minutes or until fudge is glossy and smooth. Add nuts in. and stir well. While fudge still is hot pour into a 9"x9" pan that has been sprayed with non-stick spray. . Smooth out in the pan and let fudge set and completely cool. Cut into serving pieces after cooled. Fudge will be smooth and soft. Tried this recipe several times-fudge always turns out beautifully and tastes magnificent-no fail!